Dog & Pig Design - Why Is Responsive Design Important? So what does a responsive website actually mean? Well, first thing to note is that it is all in the design of the website so that content, images and structure of the site remains the same on any device. Building a responsive website ultimately means that you are providing the optimal viewing and interaction experience for everyone – no matter whether they are viewing from desktop, tablet or mobile. The screen adapts to any device. Some of the benefits of a responsive website include easy reading, better navigation with less resizing, panning and scrolling. But that’s not all the benefits. For you as a business owner you should take note of these top 10 reasons below, which could prove highly beneficial for your conversion rate online. Take a look at your Google analytics. You’ll find the majority of your customers are now using mobile and tablet devices and over the next couple of years this is only set to rise. The experience on your website is key! If your customers find it hard to navigate and use, you’ll find time on site reduces and in return you lose customers. Improving the ease of which they use your website will prove beneficial. From an SEO perspective, Google definitely prefers a responsive website. Not only can Google crawl your site and content easier, it also will rate your website above non-responsive websites. Page 1 – here you come! Of course being up in the Google search rankings means more people will see your website. With your website being more visible therefore you are bound to get more organic customers as a result and thus improve your ROI. With a responsive website, customers will have the confidence in the website and not have to scroll to find different elements like the basket, which will assist them in checking out. A full page should load in less than 2 seconds and the page above the fold, under 1 second. A responsive website can quicken up loading times to ensure these standards are being met. When you have a slow website, you’ll find customers will leave your site quickly. The way tech is developing it won’t be long before people are viewing websites on watches and glasses. The best thing about responsive is that you’re investing ahead of the curve, so when these advancements do hit you can be confident that your website will work on these new devices. Having one site that adapts to all devices over one for mobile and another for desktop makes it easier for everyone in the business to manage. To ensure you maximise the advantages of having a mobile site, just ensure that you include mobile-specific keywords into your responsive design site to reap the advantages even more. Customers who have a positive experience on site are more likely to stay loyal and return alongside leaving positive testimonials. You want to ensure the user journey is as simple and slick as possible to ensure you maintain that loyalty and avoid losing to other competitors in the market. More and more people are now influenced by social media to shop. People using social media are in the majority now on devices such as mobile or tablet over desktop. So if you want to leverage sharing of social content and amplify your social media strategy it is important to incorporate responsive design into your website. Depending on your market, you may have many competitors who have not yet thought about a responsive website. So, get ahead of the curve and reap the benefits from Google. However, if your competitors are already going responsive – you need to get in the game. If you don’t compete, you’re only going to be left behind. Luckily for you, we are experts in building responsive websites for all sorts of businesses. As we’ve gone through this process many times, we can chat you through every stage and can tell you what to prepare for, what to expect and some additional recommendations to improve your overall website experience. Get in touch today – we’d love to arrange a chat to talk it through and see what we can do for you. 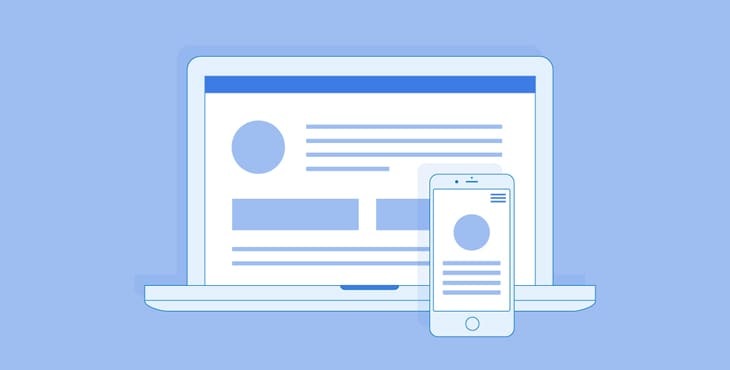 Is A Facebook Business Page As Good As Having A Website?